With the start of the new academic year 2014-2015, my role as Graduate Research officer of the Graduate committee of Clare College (and Clareity President) has ended. It was a wonderful and diverse year. Next to organising a series of evening seminars where Clare graduates present their work and discuss topics in the humanities or natural sciences, and a full-day research symposium, I set-up a new umbrella organisation with the aim to increase the interdisciplinary discussion at Clare. 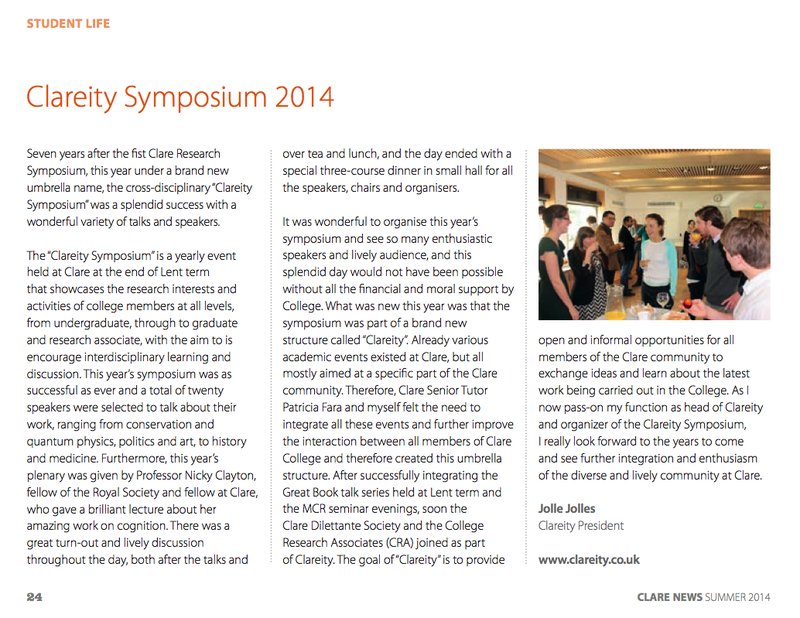 At the end of lent term I organised the Clareity Symposium. My aims with the symposium were to encourage interdisciplinary learning and discussion and to showcase the research interests and activities of college members at all levels, from undergraduate, through to graduate and research associate. This year’s symposium was as successful as ever and me and my committee members selected a total of twenty speakers to talk about their work, ranging from conservation and quantum physics, politics and art, to history and medicine. 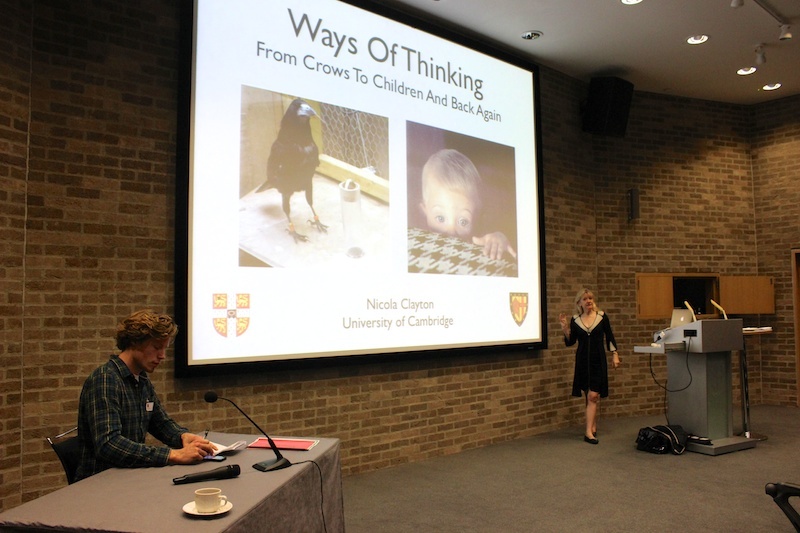 Furthermore, this year’s plenary was given by Professor Nicky Clayton, fellow of the Royal Society and fellow at Clare, who gave a brilliant lecture about her amazing work on cognition. 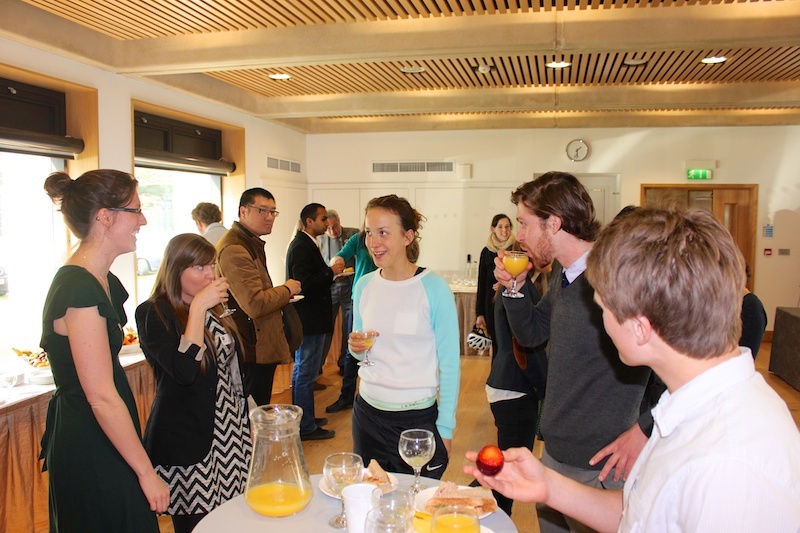 There was a great turn-out and lively discussion throughout the day, both after the talks and over tea and lunch, and the day ended with a special three-course dinner in small hall for all the speakers, chairs and organisers. 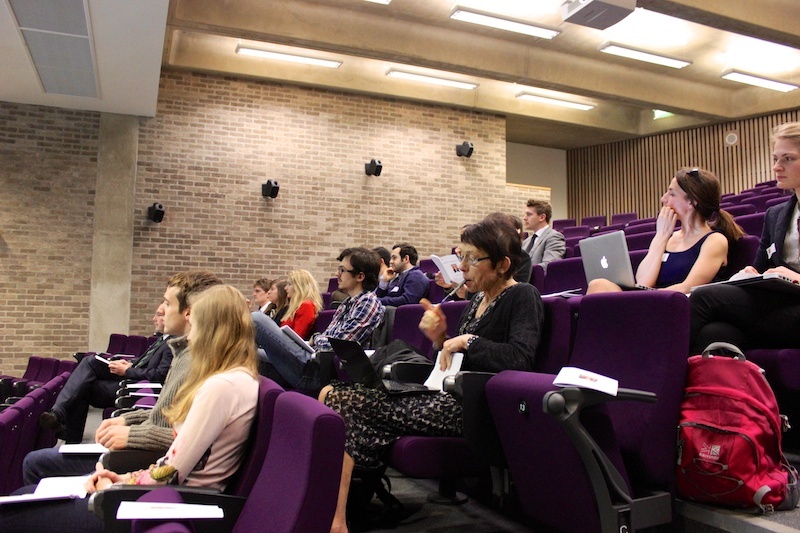 It was wonderful to organise this year’s symposium and see so many enthusiastic speakers and lively audience. With my role as Research officer at Clare I really wanted to add something new, something to further improve the interaction between all members of Clare and the discussion of the arts and sciences. Although already various academic events existed at Clare, they were all mostly aimed at a specific part of the Clare community. 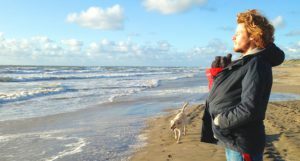 I felt the need to integrate all these events and with that in mind created together with Clare Senior Tutor Patricia Fara the umbrella organisation “Clareity”. 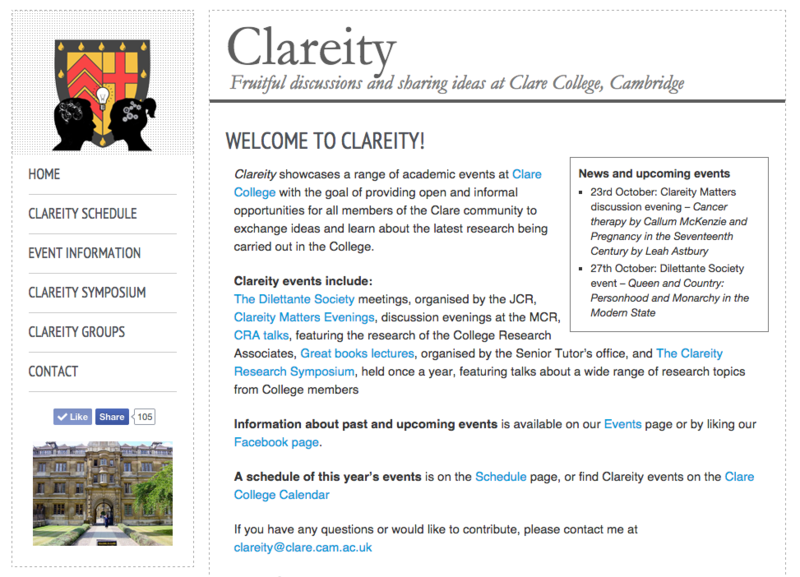 “Clareity” brings together several academic events organized at Clare College with the goal of providing an open and informal opportunity for all members of the Clare community to exchange ideas and learn about the latest research being carried out by Clare College members. After successfully integrating the Great Book talk series held at Lent term and the MCR seminar evenings, we soon managed to also include the Clare Dilettante Society and the College Research Associates (CRA) as part of Clareity. 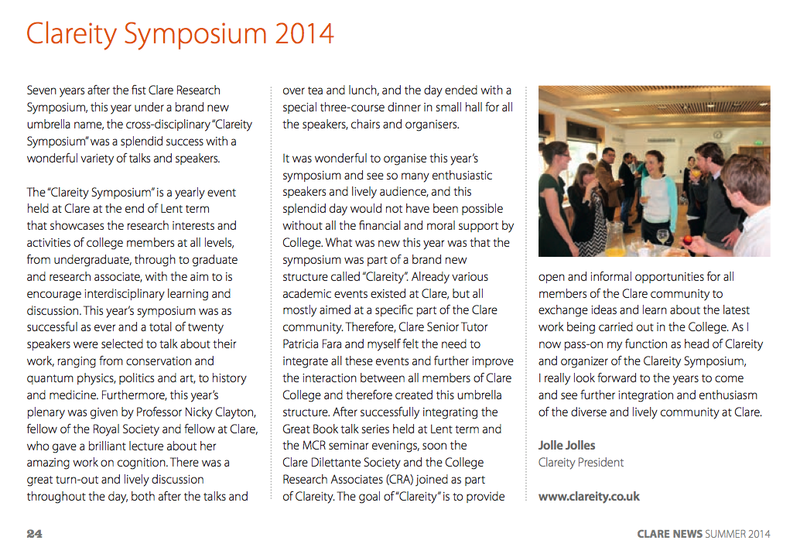 As I now pass-on my function as head of Clareity and organizer of the Clareity Symposium, I really look forward to the years to come and see further integration and enthusiasm of the diverse and lively community at Clare. See the website clareity.co.uk for more information and new events.